Round 15 was huge, so it’s fitting that I have a BIG edition of the Bullets for you this week. The Makers and Breakers are back, along with the Weekend Wrap, my new Trading Rule, the Backup Bonanza and a look at Consistency in DT. Get on it! Please note: I sincerely apologise for the ridiculous amount of mentions Ablett receives in the following article. Wow. What a huge, huge week in Dream Team! There were some monster totals this week, thanks to some massive scores, most notably to Captain Gablett. I was lucky enough to put the big C on him myself, as many others did under Calvin’s guidance. I feel sorry for those who don’t have him – and even worse for those who do and didn’t put him as Captain (Dr DT, for instance). I think the best way I can describe Round 15, is that it felt like a huge game of Good Call, Bad Call. Did I pick the right captain? Did I bench the right players? Was my latest trade successful? If your answer to those three questions were in the affirmative, then you more than likely exceed the stratosphere that is the 2200’s and entered the mesosphere of 2300+. And yes, I googled that. With Gablett my new Perma-Captain, the biggest decision that I face week-to-week is which fringe players I play, and which I bench. Obviously, Get Off The Bench helps a lot, but ultimately we as individuals make the calls and have to accept the consequences. This week, I thought I would get a little creative and take a risk. I thought, considering Essendon’s poor form of late, their next game against the Cats, and fully appreciating the link between team performance and fantasy performance, that I would bench Heppell and play Lower instead. After all, Lower had been playing in the guts, and against the Suns, it could have gotten messy… Well, the best laid plans huh? Heppell chops out a ton while Lower struggles to 69. What was your bench balls-up? I. Smith over Mzungu (108)? Vardy (32) over Lobbe (94)? Jacobs (47) or Hibberd (68) over Trent McKenzie (a massive 122)? With the DT finals looming and an increased focus on leagues, consistency is more important than ever. When it comes down to the tough, gritty, playoff matches, do you really want to have your Shaw or Montagna types bringing you home? Do you really want to have to rely on Guerra to post a big score? Thought not. Here’s a list of the most consistent premiums going around. PLAYER POSITION AVG S.D. TONS/G.P. S.D. stands for Standard Deviation, and G.P. stands for games played. Firstly, I will just point out that Standard Deviation is greatly affected by the mean – so highly consistent players with a lower average have a lower S.D. and therefore appear less consistent than players who average more, but we would intuitively say is just as, or more, consistent. Regardless, the above table shows the most consistent players who qualify as premiums (90+ for Backs, Forwards and Rucks, 100+ for Mids). So if you’re looking for upgrade targets you can rely on, give these guys a look. There are a few key points we can take out of this exercise. The most inconsistent players are the ones struggling for form – Broughton, Bartel, Hodge, Montagna and Goddard all had indifferent starts to the year. Sylvia, Adcock and Stanton however, have all struggled lately. The only reason why Ablett is in there is because he has slowly increased his average over the whole year. It’s basically risen from mid-90’s to what it is now over the course of the season. Consequently, his S.D. is quite large due to his high spread of scores, but he has actually been quite consistent week-to-week, true to form. Many of the more consistent premiums are Dual Position Players. It’s easy to see why – if they are playing poorly over the length of the game, they can always be moved into the midfield to see more of the footy, which often helps a player get into the contest. No-one wants to see their team bundled out in the first or second week of finals when it has the potential to take out the Premiership, just because of a few inconsistent players. Consistency – it’s priceless. I’m a big fan of making trades count. So I’ve brought in a personal rule as of last week, where I can only upgrade to players who have experienced both their byes. It’s imperative at this stage of the year that we get our best team on the park as much as possible, and nothing is more detrimental to that than a silly game off. Except for maybe Buddy’s elbows. It’s handy, because it also helps narrow your options, which either means an easier choice, or you don’t end up pulling the trigger (saving you precious trades). As a result, last week I traded in Cloke, and I can’t be happier. And a few weeks ago, I was a very happy man when I picked up Ablett for basement price. The No-Byes Rule also stopped me picking up Sylvia, and look how well that’s turned out! Anyway, the reason why I bring this up is because it’s an MBR this week, which means there are 3 more teams-worth of players that are eligible under my new rule. Pavlich, Fyfe, Broughton, Thompson and Sylvia all become bye-free premium options for our consideration. Maybe I created the rule to make my trading more systematic and sensible. Maybe it was because I knew it would help me limit my trades. But for whatever reason, it’s working, and I’m sticking with it! 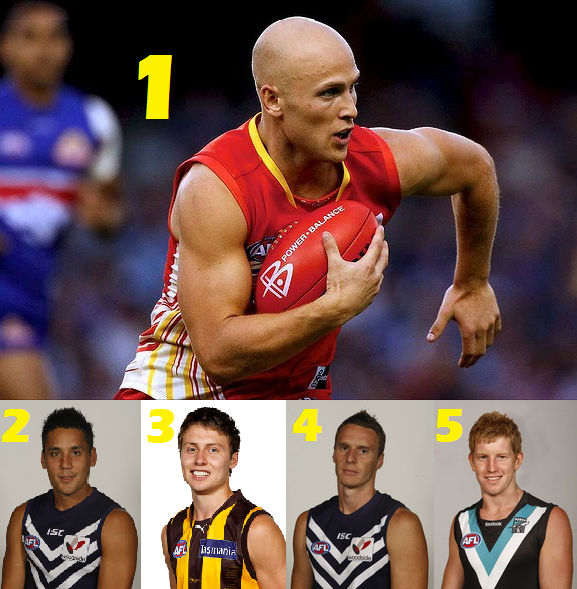 It should come as no surprise that Dream Team royalty Gary Ablett Jnr. takes out top spot in the Makers this week. The Suns maestro had 34 disposals and 3 goals. A pretty good game on the surface, but it doesn’t seem to be worth the massive 175 points he totalled. Then you notice the incredible 14 tackles, and you can suddenly understand how he scored so highly – work ethic. The guy is unstoppable, both physically and aerobically. If you don’t have him, forget about trading him in – he’s now worth a steep $487,700. Although with an average of 141 over his last 5, you can see why. Actually, I take it back. You need him! Greg Broughton had a terrible start to the year, but he has turned it around of late, which makes me wonder about his pre-season and whether he was carrying an injury. The stats don’t lie – over the first 7 games, he averaged 66 without a single ton. Over the remaining 6 games since, he’s been going at 110 points a game with 4 tons in that period. Basically, he’s turned some kind of corner… He scored 149 this week against the Suns, which backs up the 139 he had last week. He’s currently priced at $361,800 with a BE of -2, so this is easily the cheapest he’ll be before DT finals, so if you want him, get on after Round 16. How good is Liam Shiels? The honest answer – probably not that good. At least, not as good as his 147 suggests. This is supported by the fact his SC average is only 93, compared to his 111 in DT. But what do we care? What he does have is a huge work tank, clean skills and the good fortune to play in a successful team with a very lucrative playing style. That 111 just happens to be the 7th highest in the league, and seeing as he averages 131.7 over the last three, we can only assume he’s getting better. Jon Griffin’s 155 against the Suns was not only a personal record, it eclipsed his previous effort, and anything Sandilands has managed to cough up this year. It was probably a toss-up between Roy’s boy and Ablett for BOG honours, which really, is an honour in itself. If you still have Sandilands for whatever reason, consider trading him for the ex-Crow. He’s a hell of a lot cheaper than the other in-form rucks in McEvoy or Goldstein. Buddy’s first game back was more underwhelming than a Riewoldt set shot, to say the least. First, he misses the massive rivalry game against the Dons where he was destined for 130, and then he serves that up in his first game back from suspension? To be fair, it was against the benchmark side in the Pies, and he was getting double-teamed, but good players find a way to make things happen. Drew Petrie destroyed a few scores with his 51 in the Sunday twilight match against the Saints. He had 2 goals in the first quarter, but was rarely seen afterwards. It just rubs salt in the wounds of those who covered Sandilands with him instead of the other options (Goldstein, Lobbe and Griffin) available. A large chunk of coaches traded in Sylvia at $317,00, thinking it was a massive bargain. I mean, it should have been – but 3 weeks later, he’s down to $304,700 with a BE of 102, and dishing up very dodgy scores. He’s averages 67.2 in his last 5 – which basically makes him the Anti-Broughton. If you haven’t got him, I suggest that you don’t consider him until he puts a couple of good scores together. Isaac Smith tricked us last week with his massive 138, and shed 85 points just one week later. I haven’t been fooled so convincingly since I discovered the oriental woman who works at the local newsagency is actually a ladyboy. I played you ahead of Mzungu mate, you owe me. It’s probably been a long time coming, but Dawes finally makes an appearance in the Breakers. He started with a bang, averaging 110 in his first 3, but since he has been exceedingly average. Consider yourself unlucky if you were persuaded to add him into your team. Prepare yourself for another (comparatively) boring round this week, with the 4th of 5 MBR’s upon us. So no Fremantle, Melbourne and Adelaide players this week, modify your team accordingly. Tip of the week: Check out your remaining league match-ups, and seeing as there is only 3 remaining, figure out where you’ll most likely finish on the ladder. Then decide if it’s worth pulling the trigger on a trade or two to get an extra win – it could be the tie-breaker if you have a hard trading choice to make. P.S. I’m posting this at almost 4.30 in the morning EST. So whoever gets ‘first’ – good effort. But you’re still lame. Contact me on Twitter @tbetta9 for the latest. Broughton, Seems to be getting a lot of the ball but can dud it up! What to do with Broughton?, need a back upgrade for Puopolo. Seems to be running free now Freo have there backs back in “order”…..no more byes. Anybody else considering him? Got him.. But if I didn’t then yea I definately would consider him. No more byes after this week and playing thorugh the mids a fair bit so yeah jump on. Lads should i bring in lobbe for D.Hille or Z.Smith and with that cash should i get rid of krak and get swan or should i get somone else?? Lobbe for Hille and krak for swan sounds good.. Thats what i’d be doin anyways! Is Gilbert and/or Gram worth the punt?? Is Hibberd to Adcock a good trade?? No and not until Adcock hits form. Any news on Z.Smith? will he play this week? Whatta ya reckon…..few dudds but u cant have em all !!!! does anyone think it is worth picking up GAJ this week for boak or should i go boyd this week and upgrade someone else? so in other words, is getting GAJ worth sacrificing an extra upgrade? Look at Gazzas record, i wouldn’t call it a sacrifice !! Awesome write up! Wish I had more hawks! FWDs and MIDs are set just need the one more upgrade with $225600 in the bank which needs to be spent. Is Scotland the right choice? going for league, other options? mmmm I might just go to Scotland anyway, as I have 3 starting hawks + Puopolo, and I play my main contender in the league when the hawks have the bye means I have 2 extra hawks starting if I include Suckling or Birchall so I think I might just go to Scotland. Or I get Suckling and possible drop a game just so I my teams in top shape for the GF if I get in. If you have enough you could downgrade a cash cow to free up some cash. * denotes players with finals byes. The benefit of OPTION 1 is that I have two trades left for the finals but only $50 k and the benefit of OPTION 2 is that I have $100 k and a def/mid DPP link but I only have one trade left. What do you guys think? Are these the right premiums I should be getting. Is 1 or 2 trades enough for finals? Have i seen this post before? or am i just psychic? Yep, he’s posted it at least 5 times already. coming 4th in the league i want to win,any advice would be great,cheers. Leave your backs alone, you have Thompson, Sylvia and Mzungu in your mids this week and they all have the bye, worry about there first. Plus with Rioli, Fyfe, Dixon and possily Richo you need to cover your forwards too. Yes please get rid of Gram immediately. How many trades are ideal for finals? I would say maybe 3 or 4. But it depends on how many players u have with finals byes, ur cover, injuries etc.